Global demand for major household appliances will rise at a 3.0 percent yearly rate through 2019 to 445 million units. Freezers, dishwashers and clothes dryers will be the fastest growing products. China will remain the leading purchaser and producer, while India and Indonesia will record the fastest increases in demand. 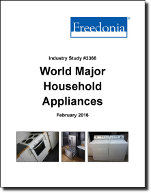 This study analyzes the 385 million unit world major household appliance industry. It presents historical demand data (2004, 2009 and 2014) and forecasts (2019 and 2024) by product (refrigerators and freezers, clothes washers and dryers, large cooking appliances, dishwashers) for six world regions and 25 major countries. The study also considers market environment factors, details industry structure, evaluates company market share, and profiles 32 industry players, including Whirlpool, Electrolux, and BSH Hausgeräte.